Harari writes cleanly without adjectives. He draws comfortably on a large reading across different academic disciplines from physics to biology to anthropology and more. His history is not history as in what date did king Alfred burn the cakes. It is the line between history and biology or what is it that made us such a force on the planet. Our intellect? Luck? Religion? Instinct? Our hormones? He works his way through the usual suspects shuffling them between references and scrubbing around the scrolls for data or even evidence. But history as he points out is “something that very few people have been doing while everyone else was ploughing fields and carrying water buckets”. 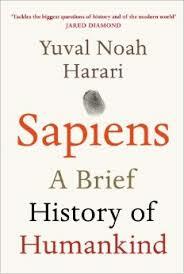 Harari is one of the very few, a learned agnostic set apart from the struggles of the world. Early on, he makes a couple of fascinating assertions that underpin a vision. The first is that it was homo sapiens ability to imagine fictions that helped us assert ourselves. Where other species think literally – a tree is a tree – sapiens imagined chopping it down and floating it down river. Imagined a god living nearby. And later we could imagine whole civilisations, as we have. And as he points out some of the familiar modern edifices are really not that tangible after all, just imagineering. “Myths, it transpired, are stronger than anyone could have imagined“. He also points out, interestingly, that the optimum social grouping for sapiens is probably around 150, anymore than that and we struggle to maintain a sense of cohesive society. In a group that big we can gossip and bicker and politicise with our family, friends and neighbours but any larger and we lose touch. It is an interesting number when you think about, say, school class sizes. One group of 150 people can relate to another group of 150 but each of us alone perhaps cannot do more. You can share beliefs but you don’t interact or not so well. One of the key points in our early cognitive history is the ability to categorise and catalogue – without it we could not organise any form of structured progress. As you read, you may find that where you thought you were a liberal humanist, perhaps in fact you align closer to a Buddhist or even an evolutionary. History as he points out is not determinist, but capricious, swift, random. His not to argue why, just how. He ends on a surprisingly positive, optimistic note (provided we don’t blow ourselves up) and then postulates: “The next stage of history will include…fundamental transformations in human consciousness and identity”. And it is very nearly here already. This entry was posted in 101greatreads, Non fiction and tagged Budhist, History of the world, Humanist, Importance of fiction, Yuval Noah Harari. Bookmark the permalink.